Some Bluesmen acquire legendary status without appearing in front of an audience of more than a couple of hundred, never making a broadcast or selling any records at all. 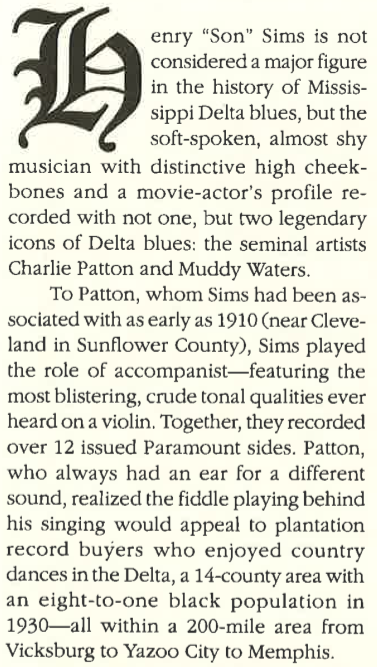 One of these is Henry ‘Son’ Sims, a fiddle-playing plantation worker who made some seminal recordings with founding fathers of the Blues; who made a telling contribution to their careers with his distinctive instrument; but who remains a footnote in the story of the Origins of the Blues. 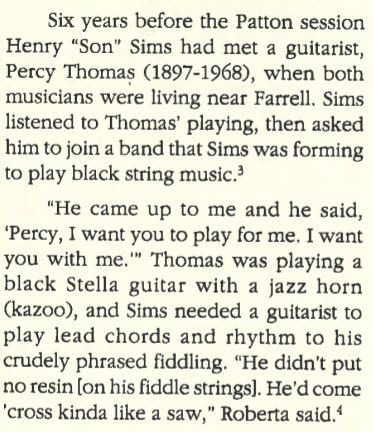 Henry ‘Son’ Sims was born in the heart of the Mississippi Delta, just off Highway 61 south of Clarksdale, in 1890. He was taught to play the fiddle by his grandfather, an emancipated slave, and he counted Charley Patton among his childhood friends. 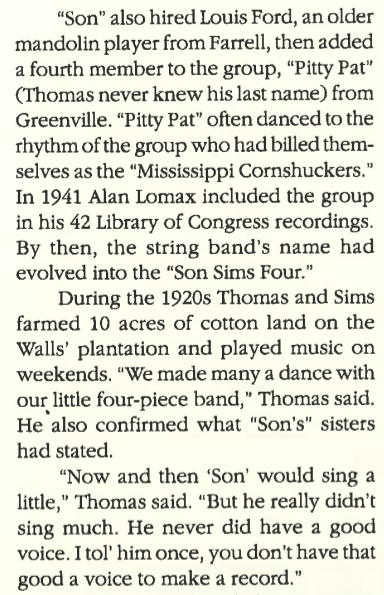 When Henry returned from Army service in WWI, he began playing with a local string band, The Corn Shuckers, at local dances, fish-fries and parties, where he would have met up with Charley and other men who lived at Dockery Plantation from time to time, like Willie Brown and Tommy Johnson. 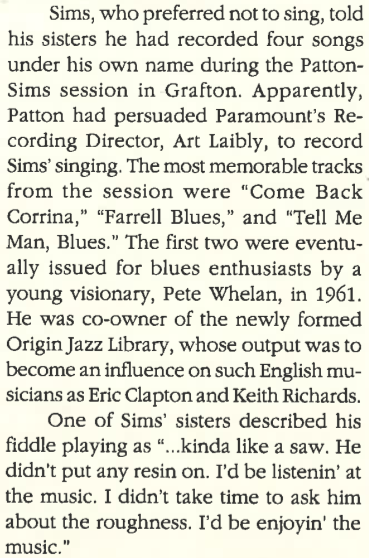 When Charley was invited to record for Paramount Records in 1929, Henry and Son House went along with him to Grafton WS. Henry played fiddle on 13 of Charley’s songs and recorded four of his own compositions, which were later issued on compilation records. Henry’s eloquent fiddle playing made him a popular addition to any string band, and he continued to play the juke-joints with Charley until the wild man of early Blues passed away in 1934.